With a smart and sophisticated look, the Laurel is designed with a 38mm baguette crystal bezel, sunray brushed with center pave dial, and nine genuine diamonds on the hour markers. The rose gold-plated stainless steel three-link bracelet band has a push-button deployment clasp to close.The JBW Laurel Women’s Diamond Watch has a smart and sophisticated look; The perfect watch for the busy individual looking for a touch a luxury. REAL DIAMONDS: Nine (9) genuine diamonds on the hour markers add a touch of extravagance to this phenomenal multi-function ladies watch. LUXURIOUS BEZEL & BRACELET: Brown-Ion Plated Stainless Steel and Baguette Crystal Bezel with a brown sunray brushed with center pave dial; Brown-ion plated stainless steel three link metal band. What you see is what you get! It is not only a watch but also a bracelet to decorate yourself. This round style adopts rhinestone to make it sexier. This timepiece looks effortlessly luxury with rhombic shape, rhinestone embedded, silver steel case, not only that, precise design and quality materials go into every detail of the watch. Fashion women bracelet wrist quartz watch equipped with round Rhinestone marks- Embedded with Time Scale Dial Plate. Each cutting edge is smooth and neat. Classic design elegant women girls bracelet dress watch with high-quality Japanese quartz movement, precise timekeeping. Suitable for daily wearing or dress occasions. Perfect gift for friends or families. Stainless steel case with a two-tone (silver and yellow gold PVD) stainless steel bracelet. Fixed yellow gold PVD bezel. Mother of pearl dial with black hands and diamond (0.048 ctw) hour markers. Dial Type: Analog. Quartz movement. Scratch resistant sapphire crystal. Pull / push crown. Solid case back. Case diameter: 24 mm. Case thickness: 5 mm. Round case shape. Deployment clasp with a push-button release. Water resistant at 30 meters / 100 feet. Functions: hour, minute. Dress watch style. Watch label: Swiss Made. 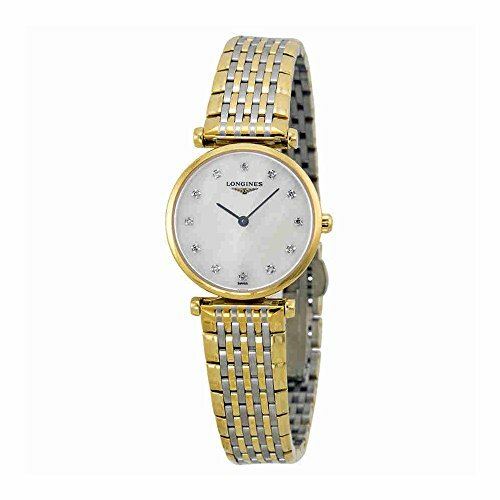 Longines La Grande Classique Diamond Mother of Pearl Two-Tone Steel Ladies Watch L42092877.Gold-tone stainless steel case. Sophisticated enough for work, but casual enough for everyday wear, the Aquaracer Watch #WAF1311.BA0817 from TAG Heuer boasts the precision of Swiss quartz and a classic, elegant style. A slender circular case surrounds a sultry mother of pearl dial, complete with silver-tone Arabic numeral hour markers, luminous hands, and a date display at three o’clock. From Bulova, this exceptional automatic watch features a skeleton sub-dial that offers a peek into the timepiece’s inner workings. The 34mm rose gold-tone stainless steel case boasts a white mother of pearl dial features a kaleidoscope overlay with rose gold-tone Roman numeral, stick, and diamond indices. This mechanical watch is self-winding and is charged by your movement, so there is never a need for a battery. Completing this look is a two-tone rose-gold-tone and stainless steel bracelet with double-press deployment closure.